Beautiful and dainty, this heart-warming design captures the special bond between the glamourous peacock in gold and the sparkling mantra crystal ball in red. Admired for its elegance, beauty and dignity, the peacock spreads its tail to denote its magnificence in vanquishing anger, temper, hatred, quarrelings and war at home. Inspired by a true antique treasure from the imperial palace which was used to end war and havoc, the shape and fascinating design of the two peacocks was maintained totally unchanged. Inspired by the need to activate its true potential and power, a shy energy infused tag is hidden under the ornament. A red-tone glaze crystal ball completes the ornament with the mantra of wisdom belonging to Manjusri. This mantra is believed be able to pierce through all quarrelsome energies resulting from an untrained mind. Sacred mantras can activate positive energies to connect with those of the cosmic deities in the cosmic realms to bring divine blessings. 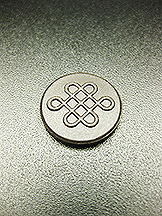 Furthermore, it is inscribed with "Li Hexagram" which represents the BIGGEST FIRE element one can ever generate in the practice of feng shui. Though many feng shui masters know how to use trigrams, but there are only a limited few powerful masters who know the secret of this hexagram, that has the capability to combat quarrelsome energies. Quarrelsome energy normally causes disputes between lovers, problems with office authorities, lawsuits and quarrelsome neighbours. This cure is best to reduce gossip, slander, office politics and help you avoid court case. This latest and greatest cure is the MOST POWERFUL cure for the Quarrelsome Star #3 (wood element). Bad temper, quarrels and scolding are widely seen due to our hectic modern living because stress is part of our life where we need to cope with. Losing our temper and initiating quarrels are sometimes unavoidable due to the additional effects of the nasty Quarrelsome Wood Energy from a bad flying star #3. That is why sometimes we can end up in big trouble without us realizing the reason, which had been led by our quarrelsome attitude with our loved ones, our subordinates, our superiors, our friends, our parents, our relatives or even with strangers. Like it or not, quarrelsome energy in our lives brings us bad aura on our crown chakra and heart chakra which could bring extensive bad luck that could last for a long time forward. Therefore, it is very important that we must not lose our temper in order for us to enjoy good feng shui and good luck. A red crystal ball is an excellent anecdote for quarrelsome energy by creating a broad red spectrum of triangular waves when lights go through it and get deflected. Once the quarrelsome energy is dissolved, it will help to create positive thinking, a better focused mind, confidence and innovativeness, progress and prosperity. This will reinforce our energy levels to benefit in every aspect of our lives. The peacock is another manifestation of the heavenly Phoenix on earth. The thousand eyes on its tail can protect you from disasters, dangers and injuries. They eyes can also protect one from burglary. These eyes are especially excellent to promote ones alertness and clarity so that he or she is able to visualize everything in the surrounding. The peacock can relight the fires of any forms of quarrelsome energies because of the fiery nature possesed by this spiritually endowed creature. 2. Display it to cure "annual" quarrelsome star #3. It is especially important to have if your maindoor is in this location or if your bedroom is located in this location. This enables you to build good relationship with your partner, family members and friends.